Last weekend Nicki and I headed across the Mississippi River and over to Little Rock, AR for the River City Comic Expo. It’s a one day show (expanding to two days next year- June 11 & 12) just a couple hours away from Memphis. We’ve done the RCCE a few times before and enjoy the day trip. 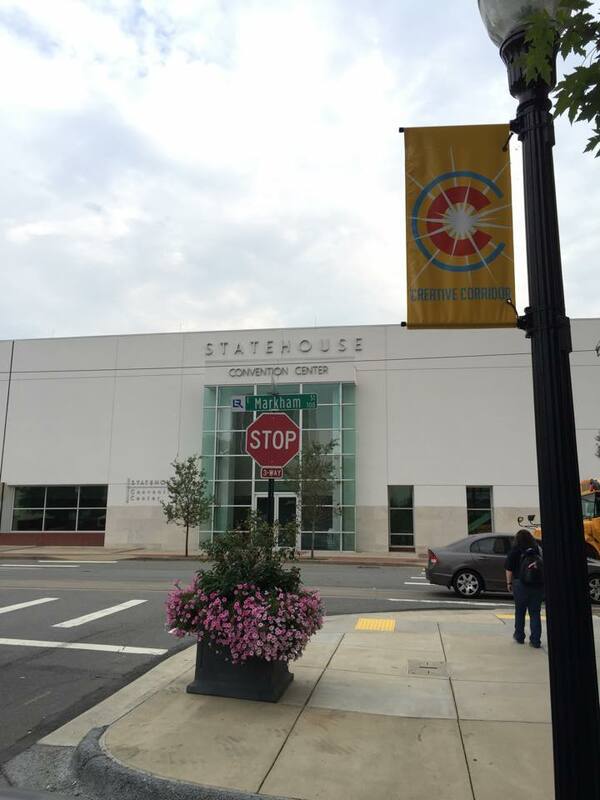 This year it moved from the Clear Channel building to the Statehouse Convention Center downtown, and we decided to stay the night in town instead of heading back the same day. Glad we did because we really liked their downtown area and the con’s new location. Lots of things within walking distance- including our hotel. We were able to drive into the convention center space to unload, then parked about a block down the street. Were also able to walk from our hotel for dinner. We had a great space again this year in Artists Alley. 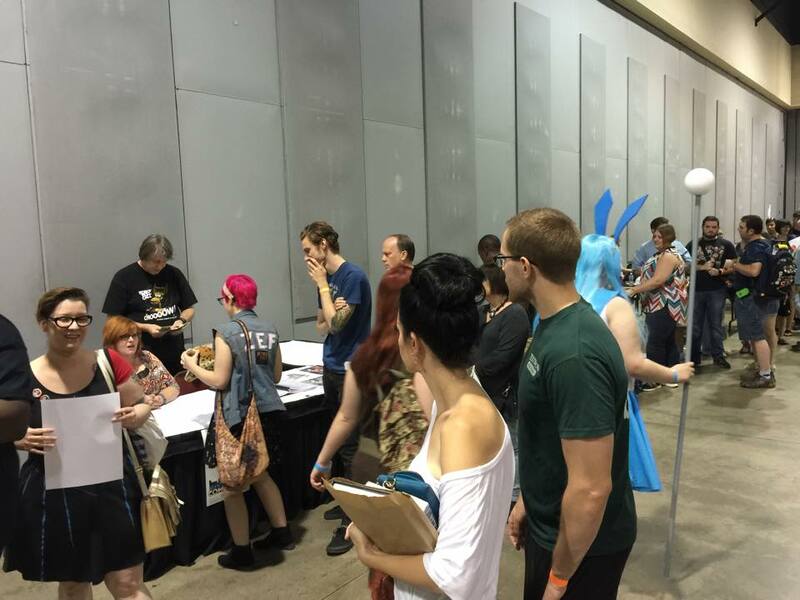 We had a good bit of space behind us so we weren’t cramped like as some cons, and the A/C worked great. I was able to get some drawing done thanks to some decent lighting, too. Most event centers seem to have lighting “dead zones“, but this space had bright and even lighting. Con Kasterborous is another one I had great lighting at. There was a large window behind me and screen which provided some nice diffused lighting. I enjoyed drawing that weekend, which is rare for me at a con. 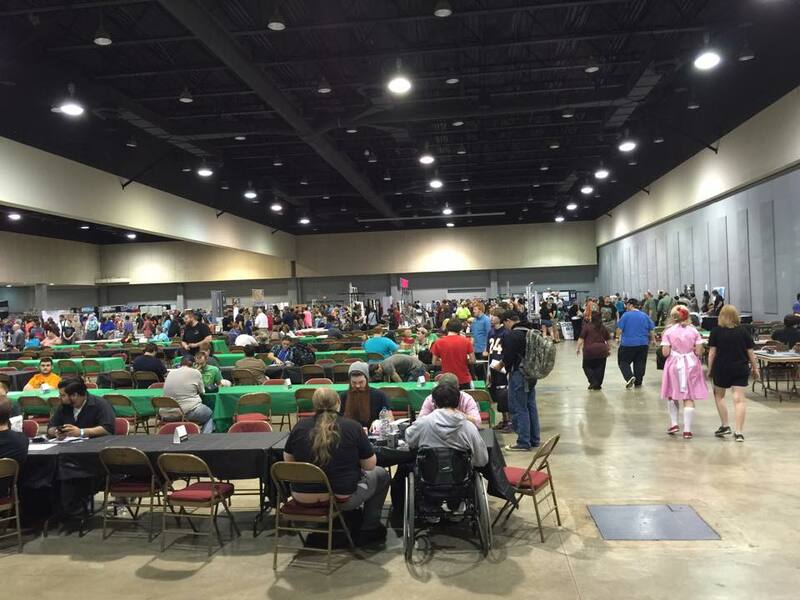 That was a great space, too- right across from the main ballroom where most of the con’s panels and signings happened, and only a few tables away from the restrooms! 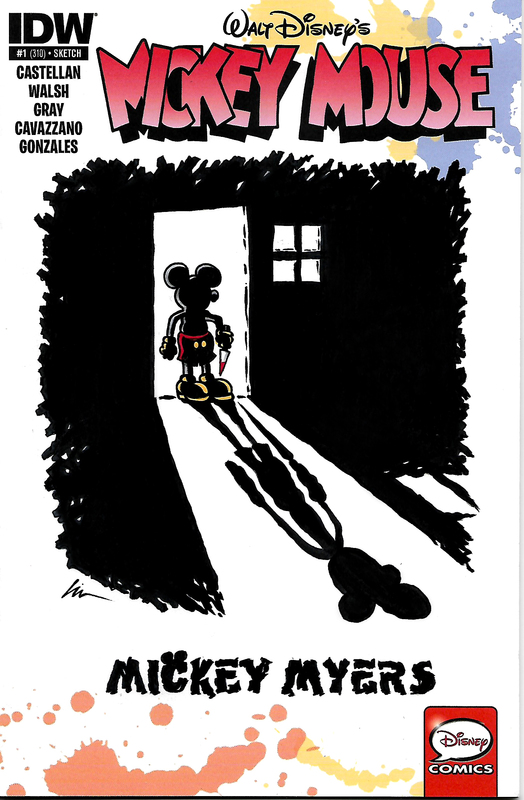 This year while I was sitting in Artists Alley at RCCE I worked on a Mickey Mouse sketchcover at my table. I had picked up a couple on our trip to ConK2015 in Huntsville, AL this summer. 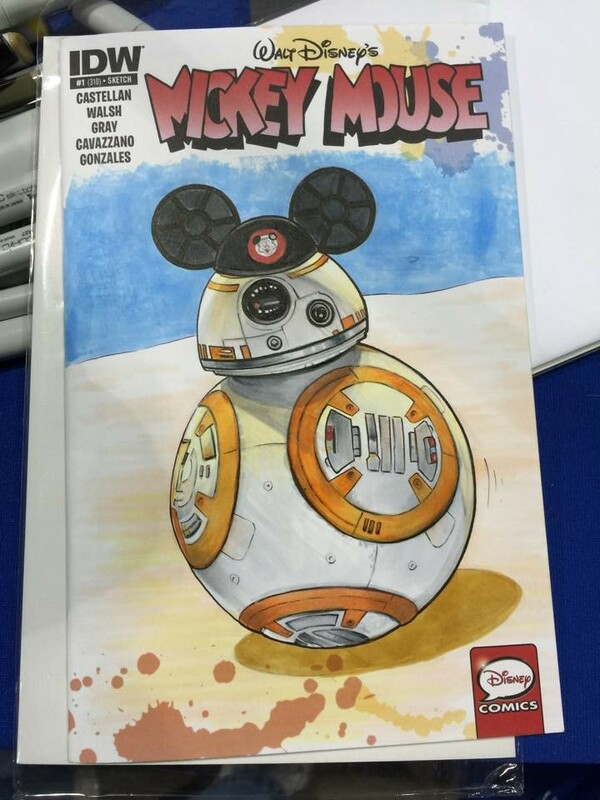 On this one I drew the new Star Wars “soccer ball” droid- BB-8. I love this little guy, and can’t wait to see him in the upcoming “Star Wars: The Force Awakens” movie this December. Finished up BB-8 once I got home. Had gotten everything but some final details and highlights done at the con. 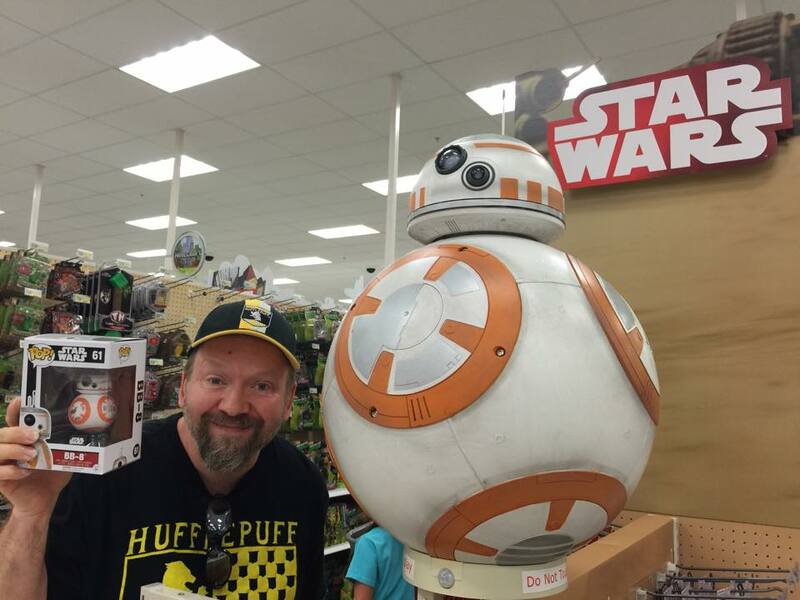 I loved that the splatter effect that was already on the comic was done in BB-8 colors- happy coincidence! 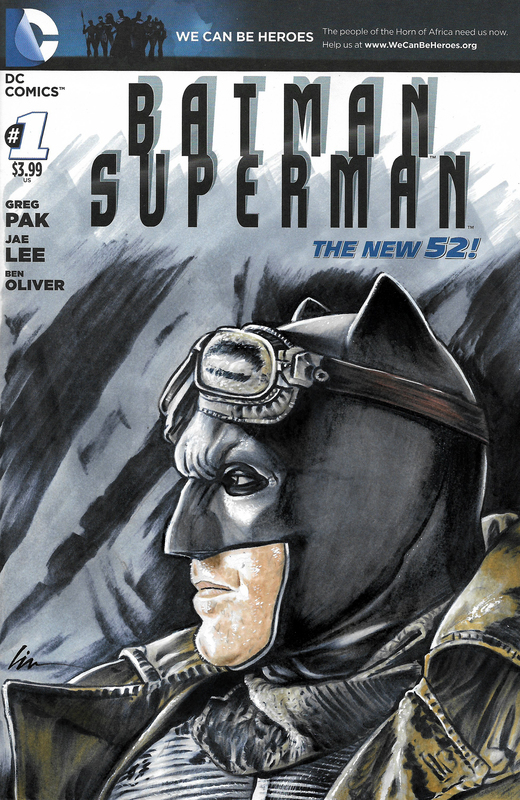 I had a few new sketchcovers with me this time including another Mickey cover, “Mickey Myers“, and a Batfleck “Batman/Superman” cover. All done in Copic markers, colored pencil, and Micron pens. 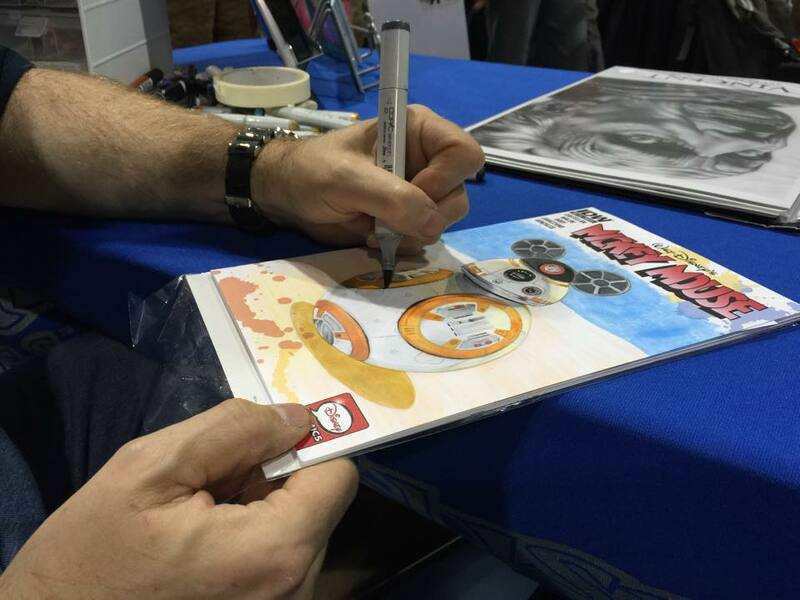 Some folks still aren’t sure what sketchcovers or sketchcards are, but working on them at the table seems to help. My new vertical display rack also made them much more visible and I had more people stopping and looking. Just need to get more done to fill it for the next shows I do. Not sure how many of my Topps and Breygent sketchcards I’ll be taking to shows in the future. I think the price kind of scares people who don’t collect them. 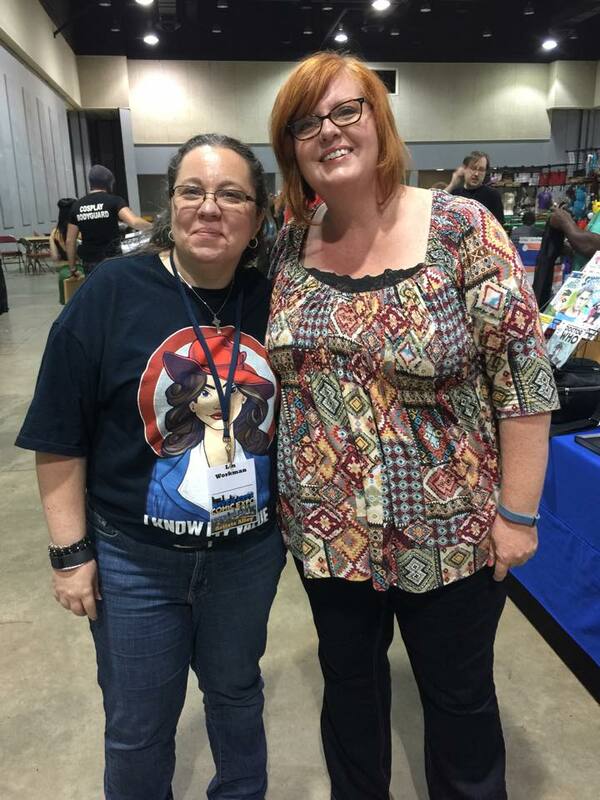 Like I said earlier, we had a great spot and were right across the way from Guest of Honor comic writer Gail Simone. We met Gail and her husband Scott at Mid-South Con in Memphis a few years back, and saw them again at the Superman Celebration in Metropolis. They’re great folks, and we were looking forward to seeing them at RCCE this year…and by the amount of people in her line all day there were lots of other folks happy having her at the show, too. 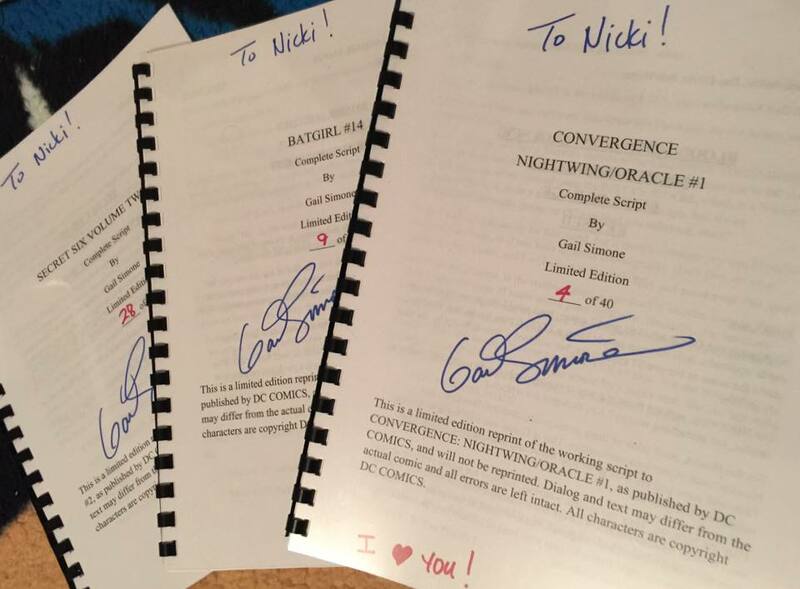 Nicki brought along her “Oracle/Nightwing Convergence” comic page to get signed by Gail, who wrote that issue. The art was done by Jan Duursema and Dan Parsons. She already had Dan’s autograph on it, just have to get Jan’s now. Did some shopping here and there or look at work by other artists when I could get away for a sec- usually while on a bathroom break. 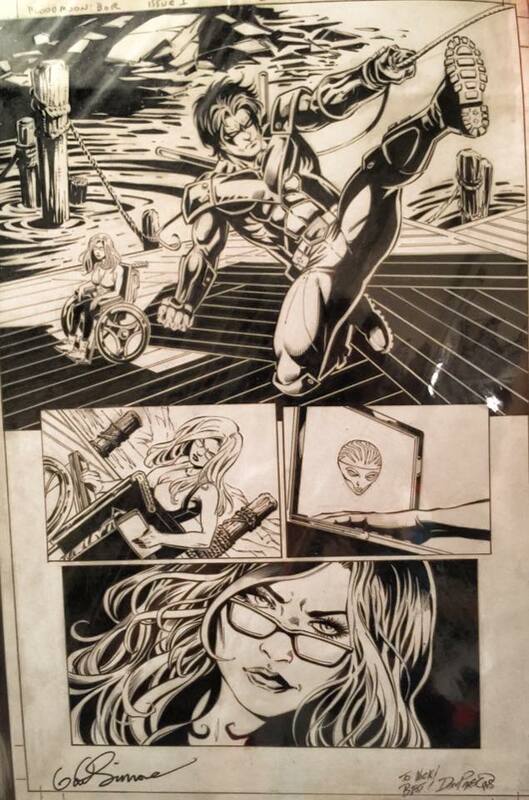 On one of those breaks I picked up some comic scripts from Gail and her hubby for Nicki. Really cool to see some of Gail’s notes to Jan in the scripts- most are hilarious. Gail’s not right..! 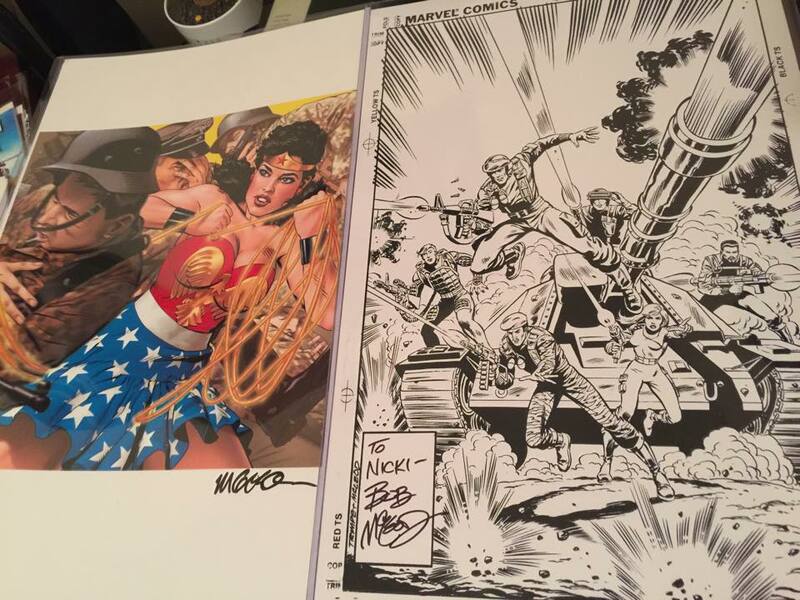 Also bought Nicki a couple prints in Artists Alley– a Wonder Woman from Michael Golden, and a G.I. Joe one from Bob McLeod. The G.I. Joe print is the cover line art to the first comic Nicki ever bought off a spinner rack as a kid. 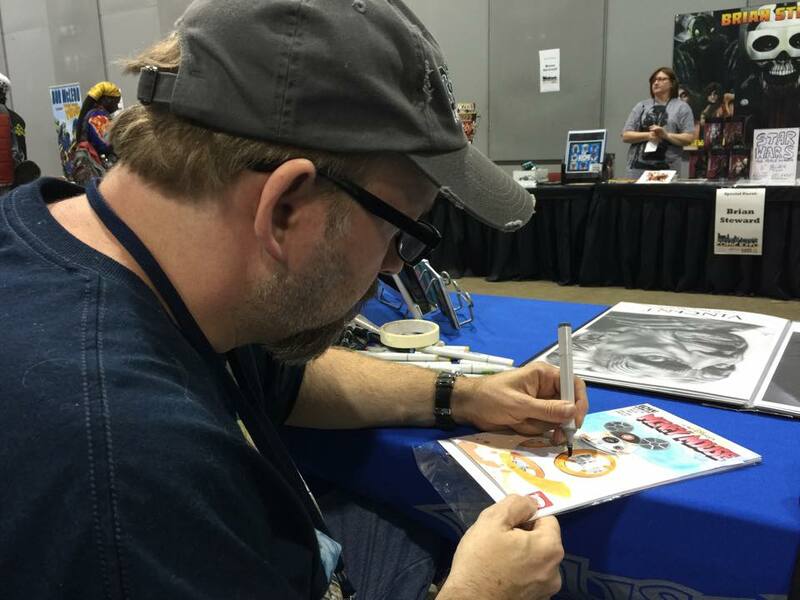 We’ll have to get Bob to sign that comic when he comes to Mid-South Con this year. Nicki got writer Larry Hama to sign it last year at RCCE2014. But I didn’t just buy stuffs for my wife- I did get to do a little bit of shopping for me. 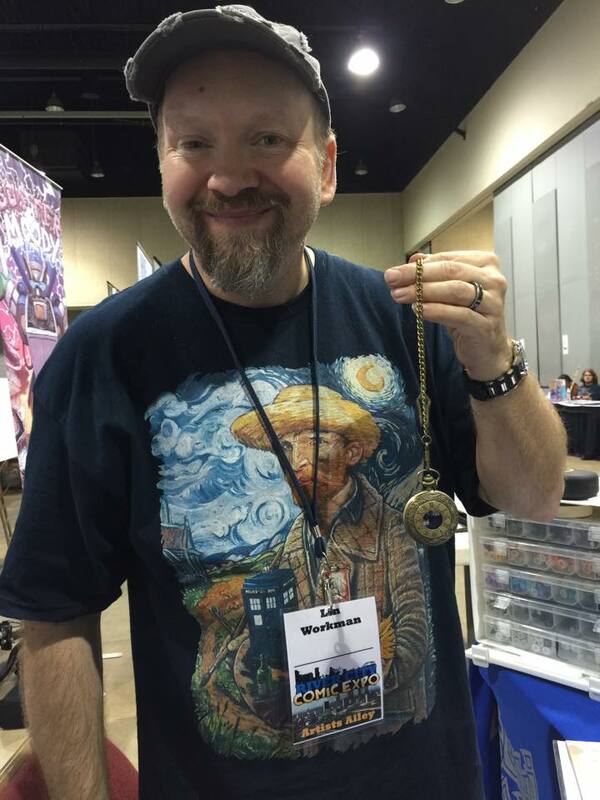 I picked up an awesome Doctor Who/TARDIS pocket watch from Odd Duck Studios who were just a couple tables down from us. Going to use it as part of my War Doctor costume I’m putting together. Nicki and I had bought some custom wrist watches from them at previous shows in Little Rock and Memphis. 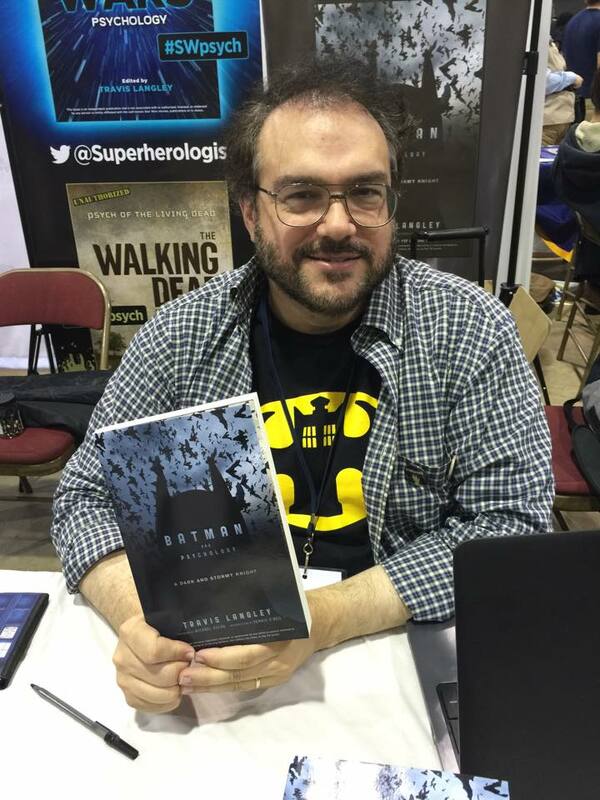 Also picked up a signed copy of “Batman and Psychology: A Dark and Stormy Knight” from it’s author, Travis Langley. Saw the bat ears on his book and his Bat-TARDIS tee and had to stop and investigate. Was cool to meet him and talk a bit on one of my breaks from the table. 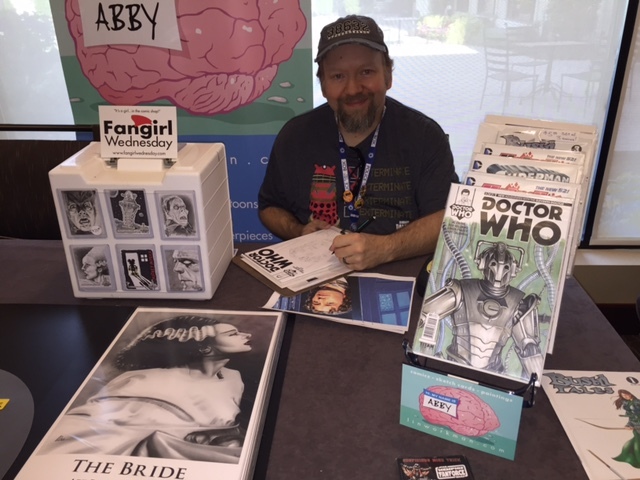 He’s going to be working on a Doctor Who book next! 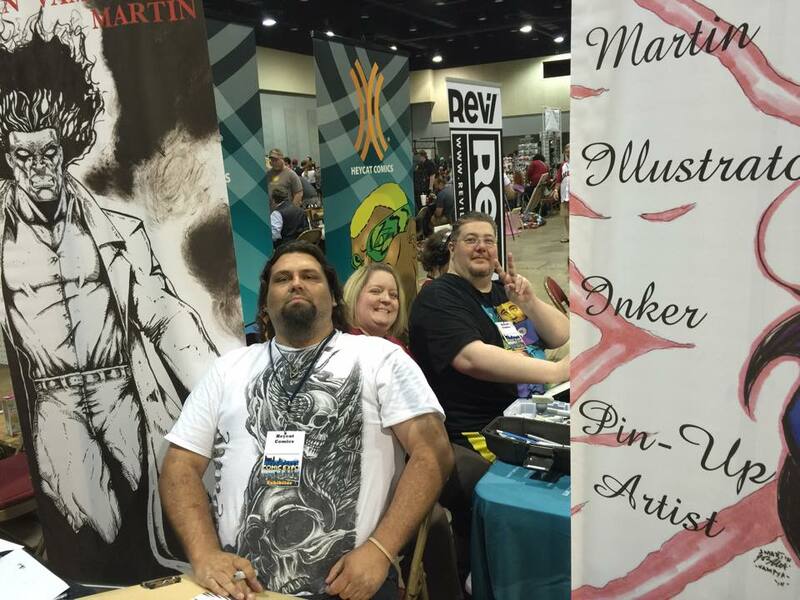 Saw a lot of familiar faces at the con- many from Memphis, like artists John Martin and Larry Cathey, and Larry’s wife Kim. 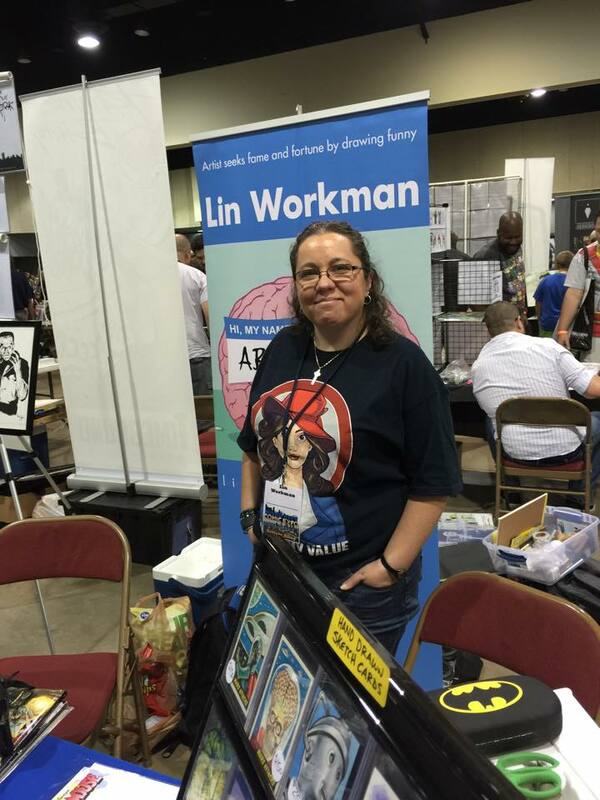 Talked to fellow artist Kelly Williams while setting up first thing in the morning. My pals Eric “Secret Stash” Crimmins and his booth babe Donnie “DonnieCon” Juengling were there, too. 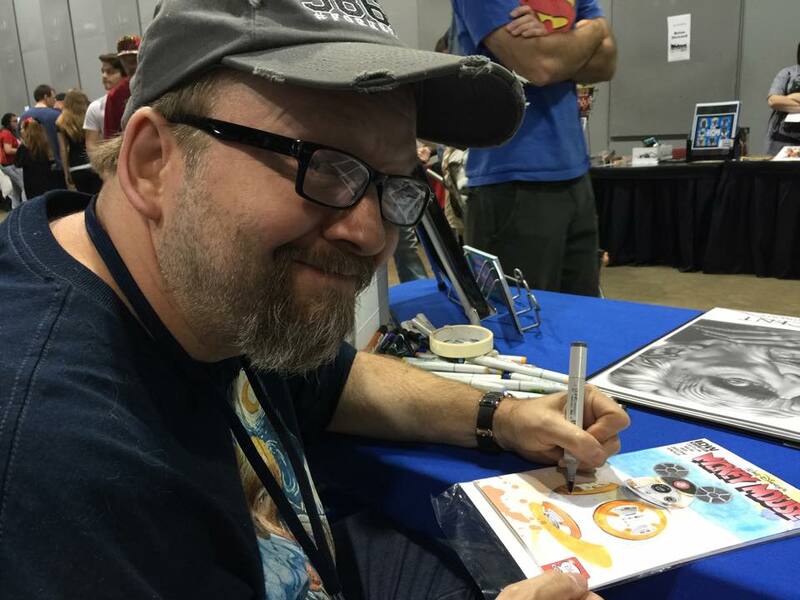 Eric was selling toys and Donnie was chatting up potential guests for his Memphis Comic Expo show back home next year in October, which is shaping up to be even bigger and better. 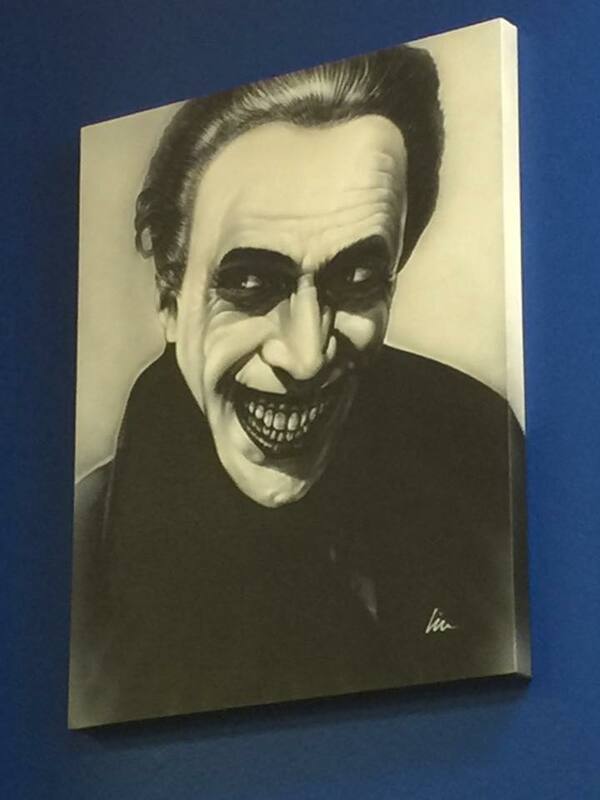 The owner, Matthew Dykes, had seen my “The Man Who Laughs” painting at the first RCCE I did a couple years ago. When I showed up again last year he asked if I still had it. I did, but hadn’t brought it or any paintings with me that trip. 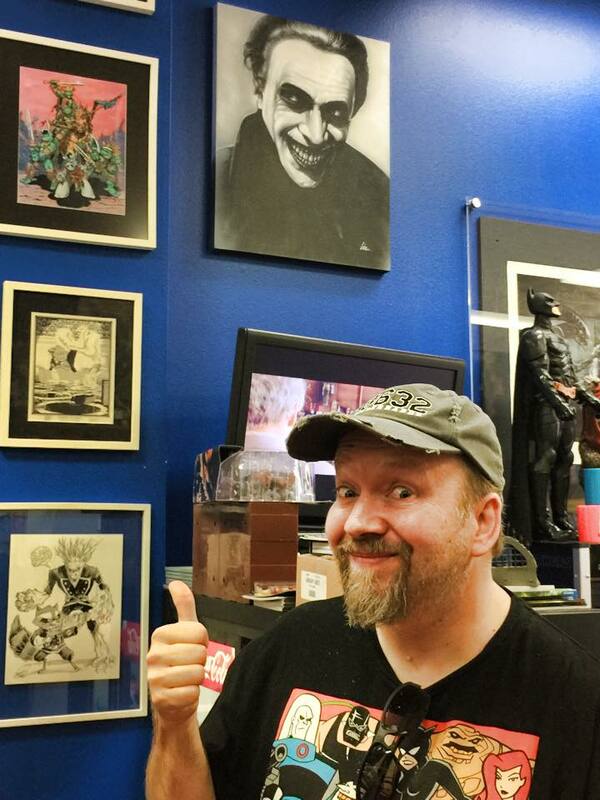 He asked me if I’d be at the Memphis Comic Expo later that year, and if so would I bring it- and I did. 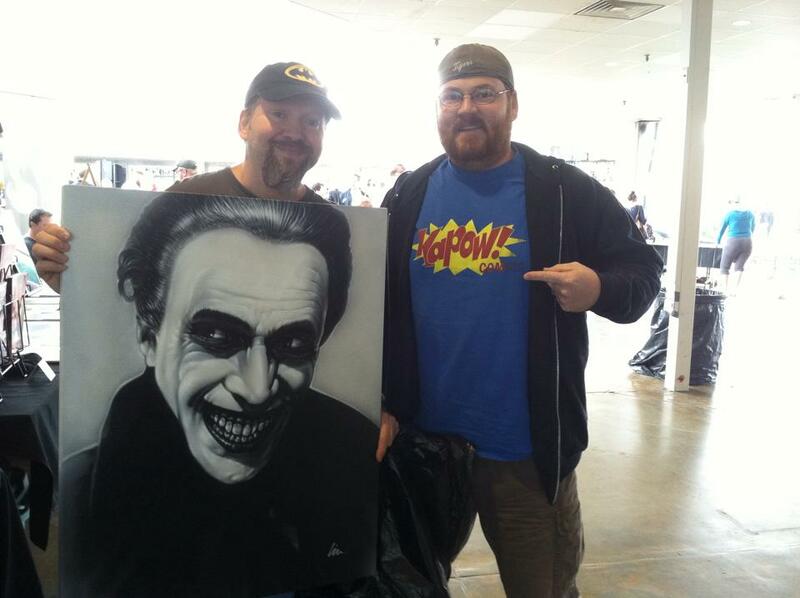 Sure enough Matthew showed up and took my (now his) Monsterpiece painting back to Arkansas with him. I had been wanting to stop by his shop, but never had time or was there when it was open while in Little Rock. Glad we made the time this trip. Good seeing both of these guys again and to know the painting has a good home and it is well loved. 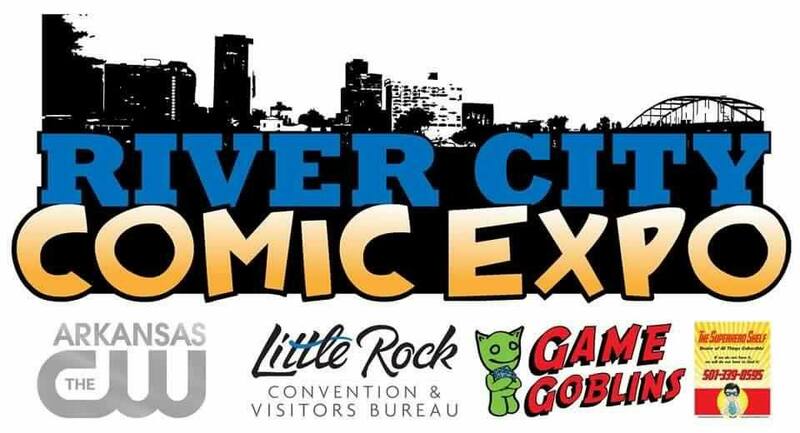 Can’t say enough nice things about the River City Comic Expo, its staff, the folks we met, and our time in Little Rock. Stay “tooned” for more con adventures here and on Have Geek, Will Travel. 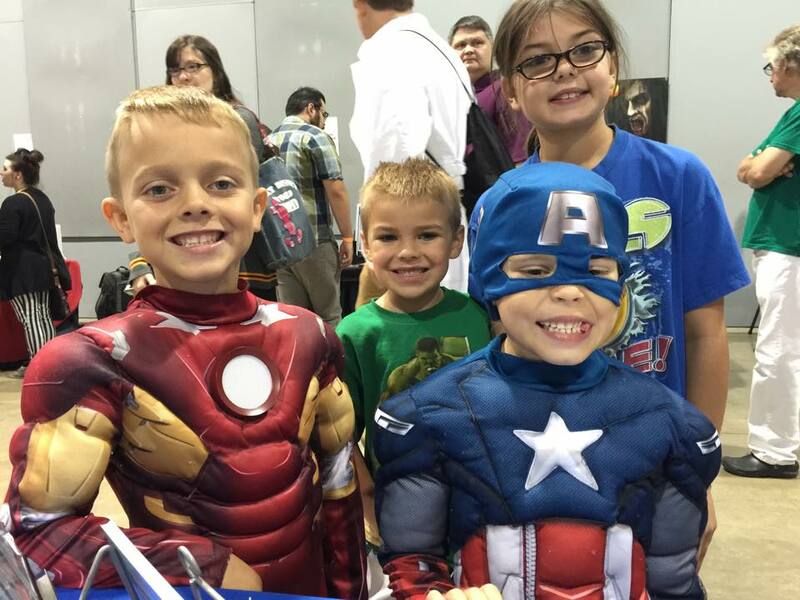 I’ll be at the Jackson, TN Comic, Toy, and Anime Show this Saturday. It’s just a little over an hour north of Memphis, and about two hours south of Nashville. 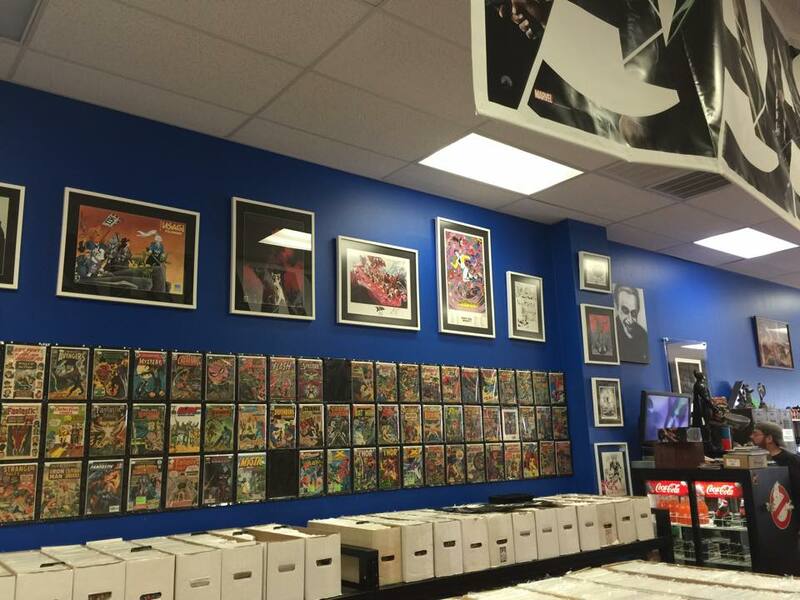 There will be lots of artists, writers, zombies, wrestlers, and more. Admission is only $10!